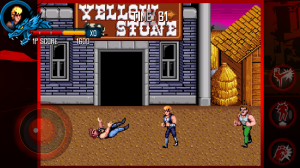 DotEmu has released the compilation Double Dragon Trilogy for iOS and Android devices. The fans of this arcade beat-‘em-up compilation will be hapy to know that the games included are Double Dragon, Double Dragon 2: The Revenge, and Double Dragon 3: The Rosetta Stone. Double Dragon Trilogy is a cooperative fighting game in which you need to rescue a damsel in distress. The player controls the martial artist Billy Lee or his twin brother Jimmy, as they enter the turf of the Black Warriors gang in order to rescue their common love. The characters have a collection of martial art techniques such as punches, jumps, kicks, and elbows which are controlled by three action buttons. You can customize these action buttons by increasing or decreasing its size, reducing their opacity and relocating them on the screen. You can play the game in two different modes: Arcade and Story. In the first one, you start from the beginning and play for the best score, while in the story mode the new stages and achievements are being unlocked as you advanced through the game. All games offer remixed soundtracks, but you can also choose the original 8-bit if you are feeling nostalgic. Double Dragon has also the co-op mode, to play with a friend in the same room via Bluetooth. In this mode, you can fight as both Billy and Jimmy, and you can assist you partner by grabbing their partner’s opponent from behind – something that your enemies can also do to you. You start the game with a certain number of extra lives and a life gauge, which decreases with the hits taken. When the gauge runs out (or the time limit reaches zero), you lose a life. You can also use some weapons, such as baseball bats, whips, throwing knives, and dynamite; in addition, rocks, oil drums, and boxes can be found in certain places.